After entering Club 122, I took a day off to relax and bask in my accomplishment. 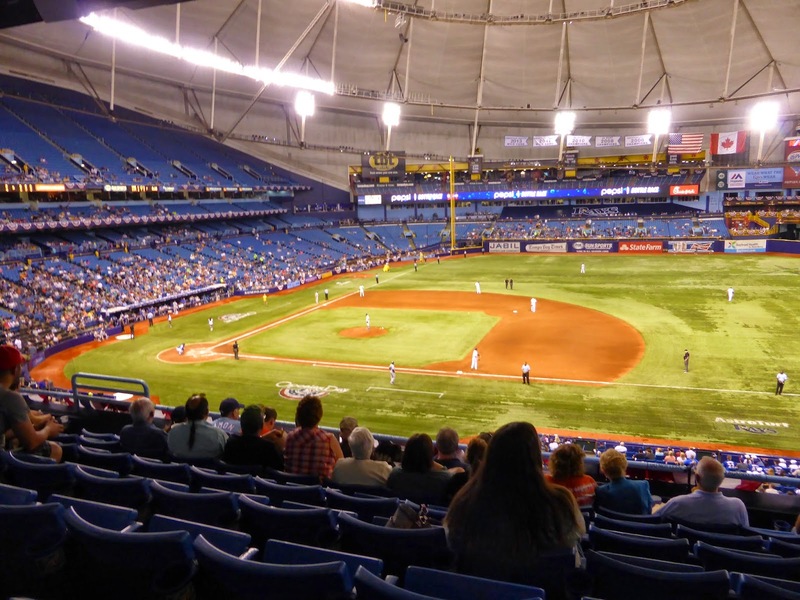 The Blue Jays were opening the season in Tampa Bay that day, but they faced David Price and it wasn't worth the drive from Orlando to see them get smoked, which they did 9-2. 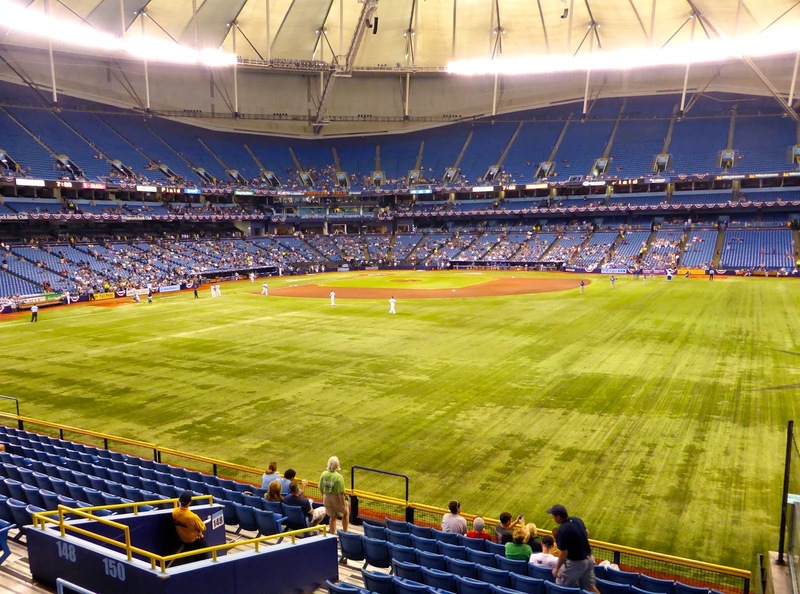 Instead, I arrived in St. Petersburg, home of Tropicana Field, on Tuesday and attended the final three games in the series. 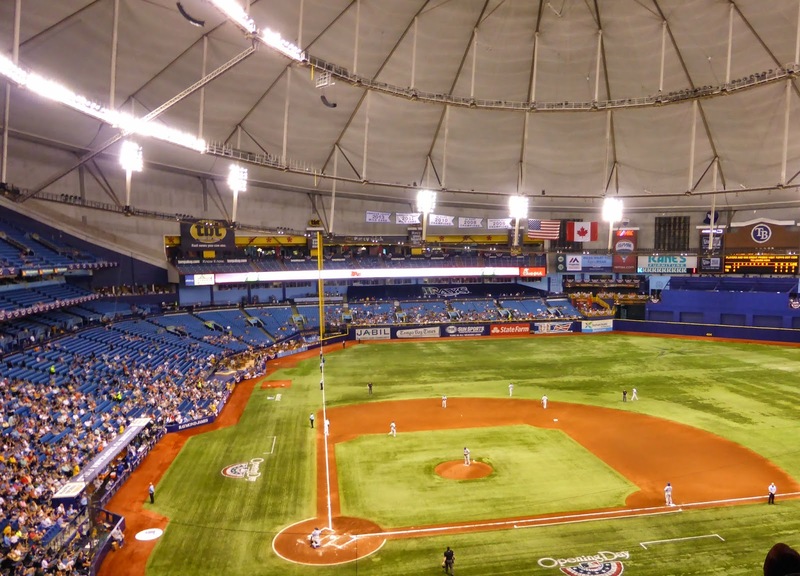 The Trop is the worst ballpark to visit in early April, when the Florida weather is still free of humidity and perfect for outdoor baseball. I am not the only one who feels this way, as the average attendance for the 3 games was 10,497. 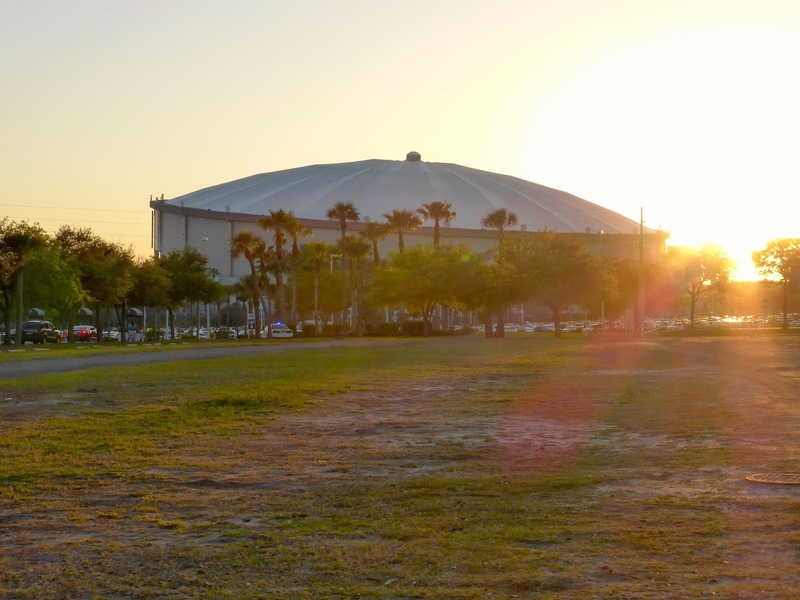 The Rays made the playoffs last year, if you recall. Can you tell the top rows in the upper deck are covered in tarp? That reduces capacity, but doesn't help matters. 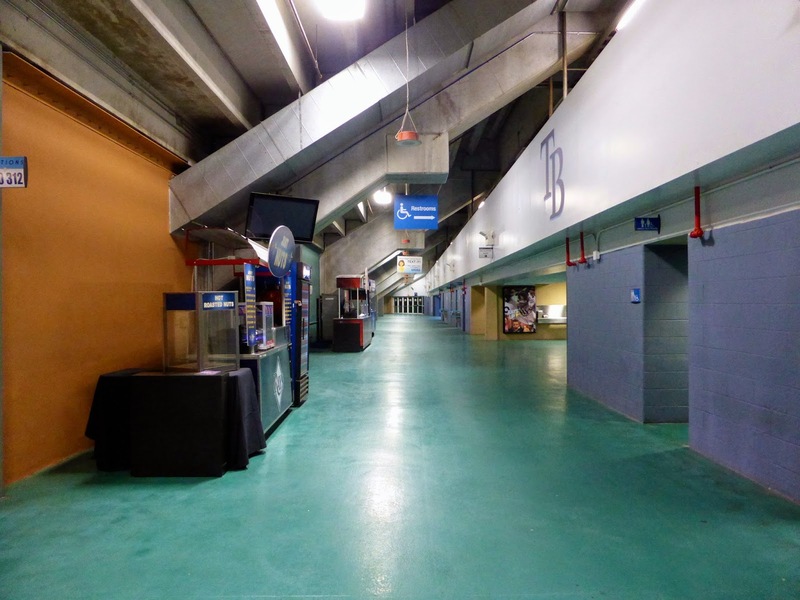 Look at this picture of the upper concourse, taken during an inning break. Not a soul in sight, and this was for the second game of the season. The main atrium is where you'd get your food options, and you don't have to worry about lines. 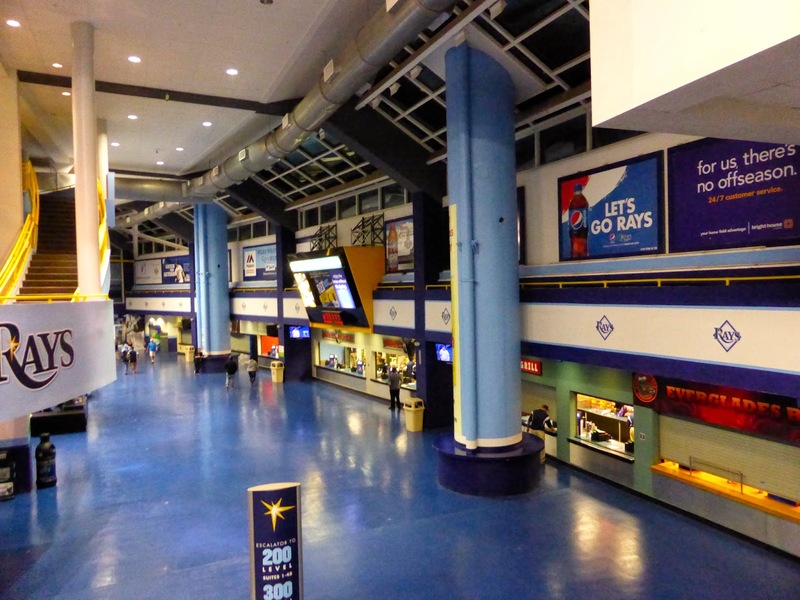 The shot below was taken near the end of the game though, when most of the concessions were closing up. 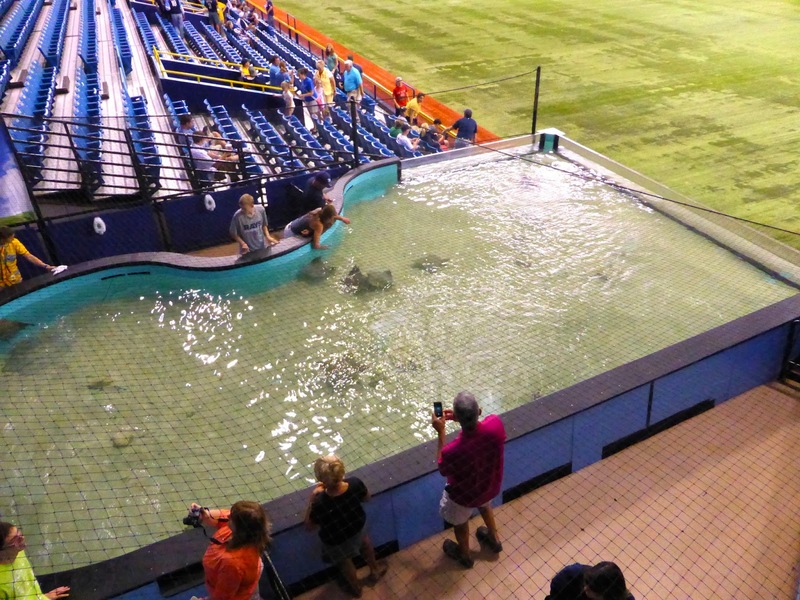 The Trop does have a lot of attractions though, including the Ted Williams Hitters Hall of Fame and a touch tank where fans can touch live rays (below). But those will only delay you for about 15 minutes before you enter the seating bowl. Sit where you want as long as you are not down low between the bases, where ushers will check your tickets. 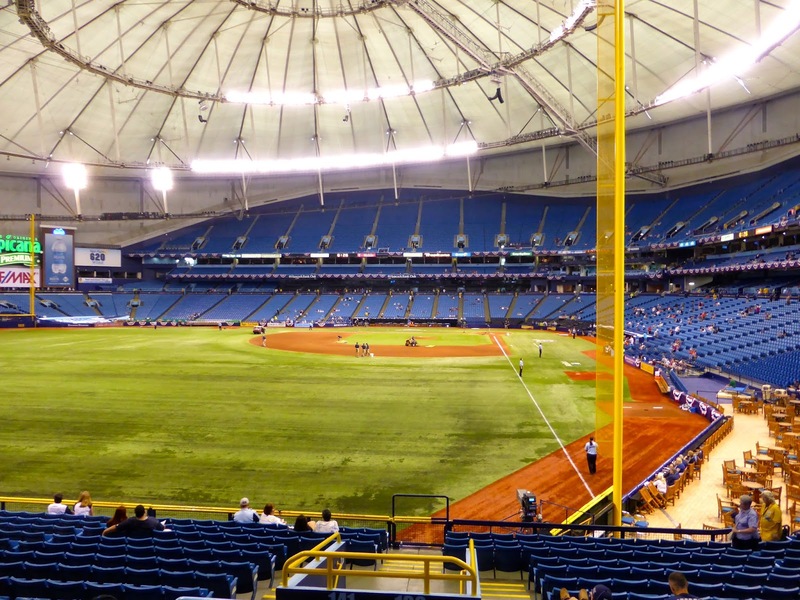 Despite the horrible atmosphere, Tropicana Field might be the best value in the majors. You can park for free along 2nd Avenue between 6th and 7th, where there is 2-hour parking until 6 pm. Get there at 4, stop in at the Brass Tap (now closed) and then walk over, where you can find tickets starting at $15 for one of the best young teams in baseball. If they could rip the roof off this place, it would finally match the product on the field. The Jays won 4-2 in a game that took 3:22, for a ridiculously low 1.458 pitches per minute (PPM). More on that later. 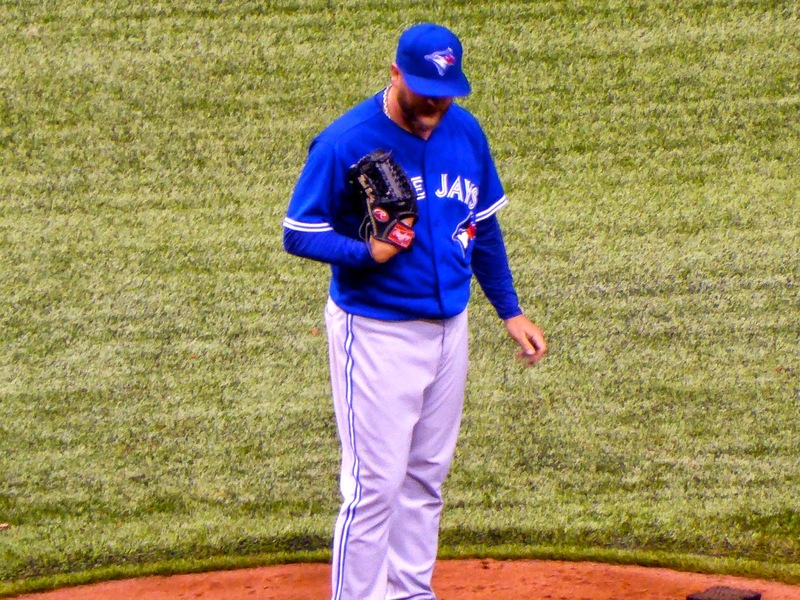 Mark Buehrle (above), who is well known for working quickly, started for Toronto and went 8 2/3 shutout innings before giving up a liner that Brett Lawrie should have caught. It was generously ruled a hit and John Gibbons decided that Buehrle had reached his limit at 108 pitches. Arrrrgggh. The Jays were up 3, give him another hitter! Anyway, Sergio Santos came in and walked a batter to bring the tying run to the plate in the form of pinch-hitter Matt Joyce. Brett Cecil came on and struck out Joyce to get the save, leading to a big sigh of relief from myself. 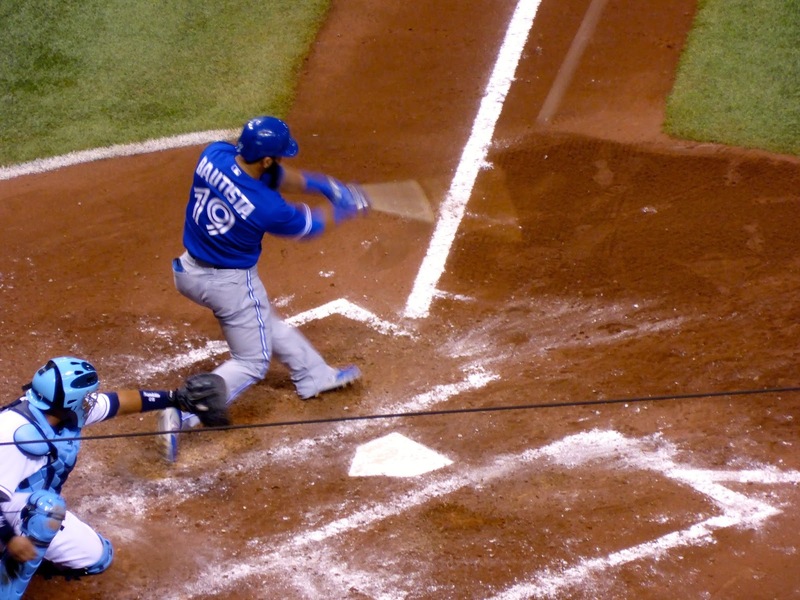 Jose Bautista hit two solo shots (the second above) to lead the offense. The game took 2:55 for a 1.629 PPM. Not bad, but still slow considering Buehrle pitched nearly the whole game. I covered this game for Stadium Journey, so received a credential and sat in the press box level (200s). There are TVs here that let you see replays, but it is pretty dark as the third deck covers much of the seating here. The Blue Jays lost 7-2, splitting the series. The game took 3:21 for a PPM of 1.527. Over the three games I saw, the PPM was 1.532. This is terribly slow and I'll be writing more about the pace of baseball in a couple of days. For the Jays, their defense was excellent over these four games, their pitching acceptable, while the offense was worrisome, going just 4-29 with runners in scoring position and totalling 11 runs over the series. 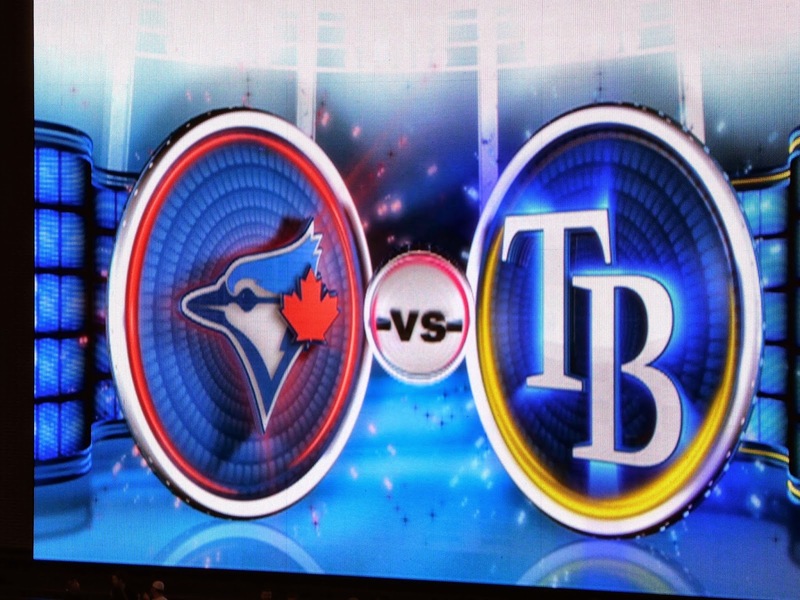 The caveat is that the Jays have struggled in Tampa historically and gaining a series split is a good sign. I have hope! 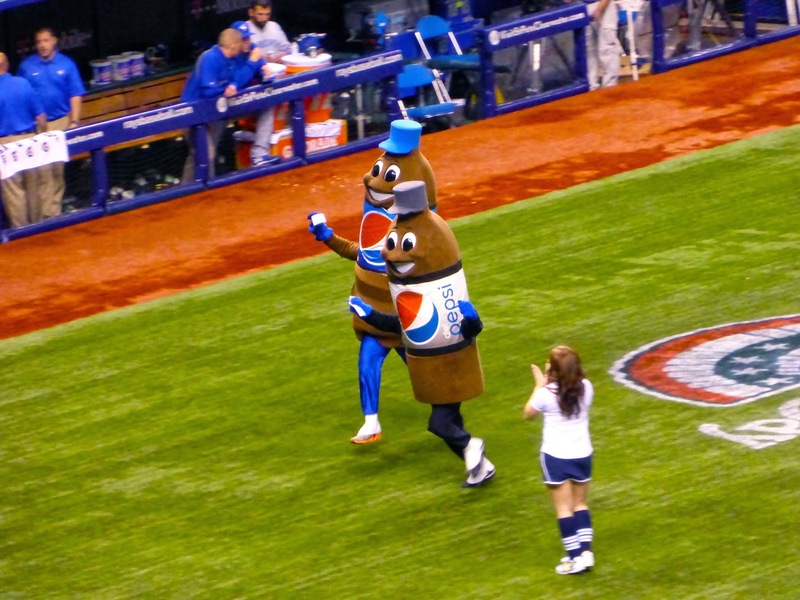 The mascot race here involves three bottles of Pepsi products, including Lipton Ice Tea. Every game they had a different trick, on Thursday there was an usher on the field checking tickets. Oh no, Lipton Ice Tea didn't have a ticket and the race was won by Diet Pepsi in a photo finish (below). 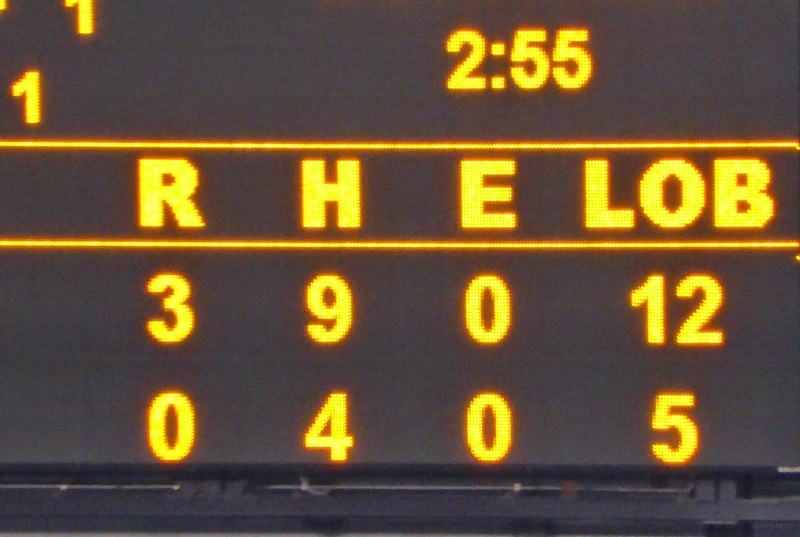 For me, this was the highlight of the final game and the lasting memory I will have from Tropicana Field. Time off. Other than a New York Cosmos game next weekend, I am going to spend April looking for a job and avoiding baseball for the most part. This MLB season has seen a PPM of 1.56, about 2.8% slower than last season's 1.6 at the same point. This is simply not fast enough to keep my attention. I stopped going to Japanese baseball because the games took too long, and I'm on the verge of doing the same for the majors. I'll post a detailed analysis in a few days, so check back for that next week.